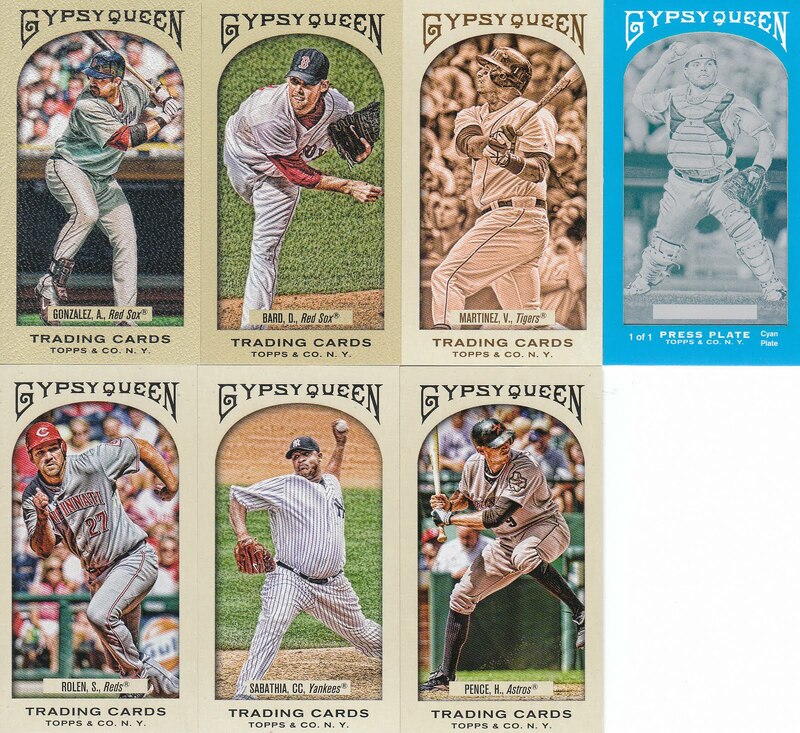 Ted over at Crinkly Wrappers recently posted some trade bait and I snagged a card for the wife's collection and for my Bronze Border Gypsy Queen collection (thus netting Ted one entry in the contest!) See pics below! Thanks Ted! The wife is going to love this one when she sees it! For the group break, the case was shipped today and will be delivered on Thursday! So hopefully I can get a video or two posted Thursday night and the rest on Friday during the day! The excitement mounts! Trades are still on-going! You have until Thursday-ish! There you go everyone. I definitely don't mind trading the A's if anyone wants them! If anyone has a problem finding someone else's e-mail for trade discussions, let me know and I might be able to help! Can't wait to start busting packs! Wow, I got home from Alabama today and found 7 packages waiting in the mail box... There's Derek from Tomahawk Chopping, Todd from MidWest Cardboard, a couple of purchase packages including a huge haul of Masterpieces from I Am Joe Collector and a bulk package of Astros from Scott over at Smed's. This is a huge haul of cards over all, including a LOT of trade bait, contest winnings that will also be trade bait, a personal white whale of a card for me, another 1/1 that I can't believe I got for a bit more than $10, and some great Hollywood stuff for the wife that Todd sent along unexpectedly. For those who traded with me, I REALLY do appreciate it, Todd you outdid yourself and I totally owe you something for those Hollywood cards! The wife was really excited... here's the video, there'll be scans after the post of the "For Trade" items! IF there is anyone I have a pending trade with or anyone I owe cards to, PLEASE e-mail me. Life has been a bit hectic lately and I don't want to forget anyone! So, the wife and I made the trip out to Mobile, AL today... a nice 8 hour drive! Tomorrow we start looking for apartments. Looks like this summer, at some point, the wife and I will be moving on out here for a couple of years. Upon getting here, I've found that the last team in the group break has been claimed! Thanks to David for claiming the Indians. I'm waiting for payment from a few more participants before I randomize the remaining 15 teams; and order the case from Atlanta Sports Cards, our AWESOME sponsor! Please let me know if any of you participants have any questions about the break. 2006 Ovation CASE GROUP BREAK UPDATE! PAYMENT DUE!!!! All confirmed participants. Please send in payment NOW!!!!! PLEASE remember to send as a "GIFT" via paypal. Please see original post for paypal payment address. I still am looking for just (1) more participant. I have put an eBay ad up for (1) slot, so if that sells then that person will be the last participant, however someone wants to step in before that sells then I will take down the ad. PLEASE LET ME KNOW ASAP if you want the last slot!!!!! Alright everyone! As soon as I get all the payments, I'll order the case! Quick somewhat free (to me) card/trade post... and group break pimpage (again)... haha! Matt... thanks a bunch! This brings my Bronze border total to 51 in-hand! Over half way there people! Alright, on an unrelated but very important note, I'm ONE person short of filling the group break! COME ON, there's got to be a Tigers or Twins fan out there who want a chance at a Verlander or Liriano auto!!!! Or any of the other available teams!!!! Someone go comment and claim the last team needed!!!! Thanks!!!! Alright, a couple of trade posts: first we have Jon over at Community Gum. 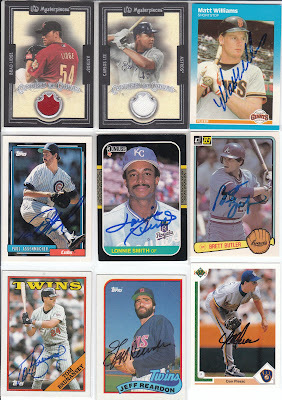 We worked out a deal to send me a few Gypsy Queen cards, and for me to send some cards off his want list. Thanks Jon. This gets you one entry as well into my bronze border contest! Next we have Charles from the Lifetime Topps Project. This was an epic trade that got a bit convoluted. We ended up swapping Mini Hobby Only Variants and then a slew of cards from each others' want lists. Also included are 11 bronze borders!!!! This'll get Charles 11 entries into the contest, the most so far! This puts me at a total of 49/100, so there's still 51+ entries available (I say 51+ because I'll take duplicates!!!). The Ortiz is for trade! That's a Tori Spelling "Private Signings" (cut off at the bottom) and a Robert Hegyes "Proof" (again cut off on the bottom)shirt swatch numbered 73/73 and 07/25 respectively. Well, that's not all she has, but it's all she'd be willing to entertain offers on! So if any of you collectors out there have Hollywood cards that you'd be willing to deal, shoot me an e-mail... and go sign up for my group break while you're at it... ok, ok, I'll stop... haha! Have a great week! Multiple Packages... including 2 from Topps... and some trades! Alright, I got a total of 5 packages in today! The first two in the video are from Topps. I opened them both because one package would be for the (2) cards we were shorted in the group break and then the other package would be for the (3) cards I was shorted from my personal boxes I bought a few days later. I was afraid they'd show up at the same time, thus I did the video so everyone could see I didn't keep the best autos for myself. After that, are three trade packages... from Dustin over at No Relics Pulled... then Donald, a fellow I met through FanBro.com and then finally, Bill Boehm over at Thorzul Will Rule. I mumbled and bumbled my way through the ending, but hopefully you all enjoy the video... lots of new trade bait for you collectors out there as well!!! Congrats to the two of you who received the "replacement" cards provided by Topps... Brian from Play at the Plate and Dennis from Pictures of Men. I will also mention at this time that I need only 3 more people for the next group break: a break of a CASE of 2006 Ovation! LOTS of hits, lots of Rookies and lots of inserts! Only $30 gets you two teams worth of cards! All the base cards shown are SP's and then of course the two bronze borders garner him 2 entries into my contest! 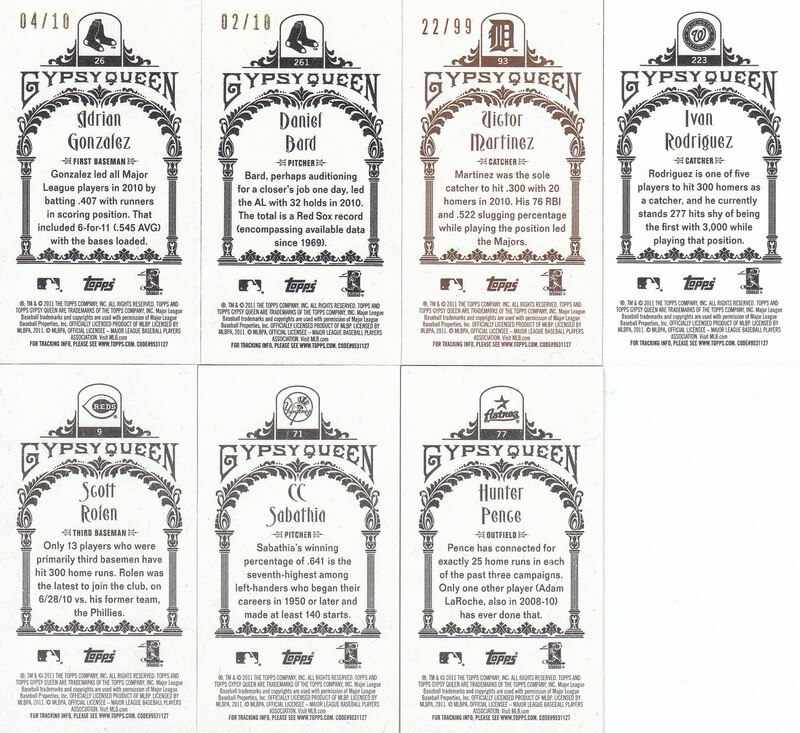 If you've got some of these to trade (even if I already have them, I'll take duplicates and still give you an entry!) then please send me an e-mail and let me know what you would like in return from my many FOR TRADE lists. Ok, as for the GROUP BREAK... currently 12 teams are claimed, we only need 3 more!!!! Get the word out peeps! There are PLENTY of good teams left and there are going to be some great teams left to be randomized off as well once it's all said and done! Only $30 will get you into the break for two teams. With over 32 "hits" available plus plenty of quality inserts and parallels, this is going to be a very fun break with some great looking and feeling cards! Well, I've done some shopping around and I think I've got a pretty nice price on a case of 2006 Ovation! (Click the link for a full checklist!) We opened a box of this during the Gypsy Queen break and I really like the set. There are lots of inserts, parallels, rookies, autos and relics to be had. At least 2 per box so a total of AT LEAST 32 hits! There are boxes with more than 2 hits so there should be plenty of good cards to go around! So, what I've decided to do is split this break into 15 slots of 2 teams a piece. Each participant will pick one team, and once all 15 slots are full, the remaining 15 teams will randomized. I'll allow some time for people to trade 2nd teams if they wish to do so! So, claim your first team with a comment below. Payment is not due immediately, I will post a payment date as we get a little further along! Oh, I guess I should let you know now how much each slot will be... for this break, it'll be $30. Keep in mind that gets you two teams in the case break and covers shipping! I will update this list as teams are claimed. First to post a comment gets the team! Chicago Cubs - CLAIMED and PAID by MATT P.
Cincinnati Reds - CLAIMED and PAID by RYAN G.
Cleveland Indians - CLAIMED PAID by DAVID H.
Let me know if you have any questions! If anyone wants to go ahead and start sending their money for the break, my paypal address is samuelpair AT yahoo.com. Please remember to send it as a gift. Well, I'll make this short and sweet! It's been a busy couple of mail days... First of all I'll show off two cards that I had Mike from Bad Wax put together for me... freakin' sweet... the Scott will be my first attempt at TTM since I was a kid. Thanks Mike!!!! Next up are two cards from a recent trade with Larry over at Sewing Machine Guy. I sent him a slew of Heritage and a Torri Hunter relic card. In return I got these two beauts... and let me tell ya, that Chris Johnson card is all kinds of shiny and just plain awesome! Thanks Larry!!!! (By the way, your opinion about the "bonus packs" in blasters is shared by this Dimwit, I'll never understand it...). 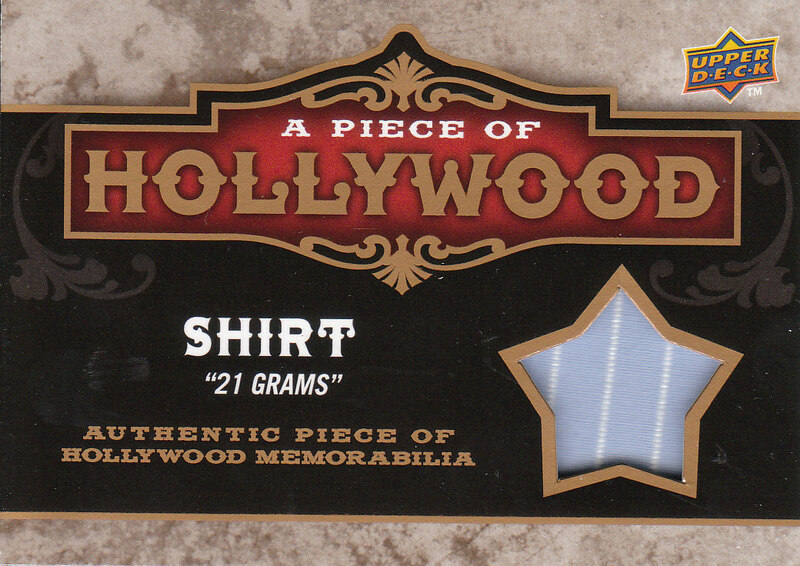 Finally, over on Shot Not Taken Ray put together a bunch of trade bait lists, most notably one of some Hollywood memorabilia cards. My wife collects the Hollywood stuff so if any of you out there have anything to trade, let me know! We put together a bit of a mega deal, with me receiving 3 Hollywood cards for my wife, a Jay Austin auto (boy does he need to practice his signature) and a couple of Minnesota Twins trade bait cards. Rhubarb Runner are you reading?!?!?! Check it out!!! 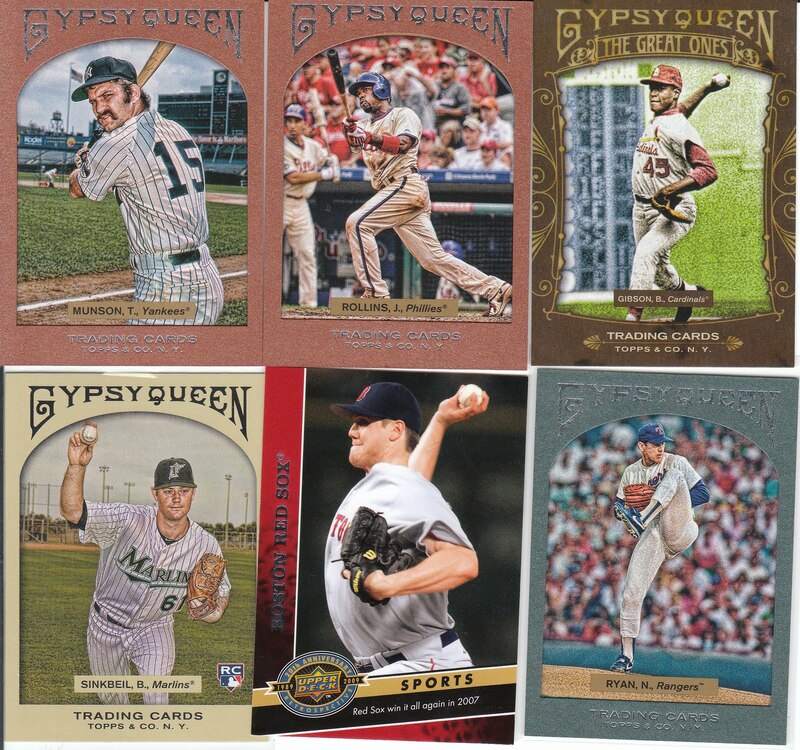 I also got an ebay package in with 7 bronze Gypsy Queen cards. I debated quite a bit about what I'd do about additional cards that I purchased myself, and how it would affect the contest. Finally I decided that they wouldn't have any bearing on the giveaway at all. For all the cards that I get from you readers, you'll get an entry fair and square. For cards I purchase myself, that's just my fault for buying them and not being patient! I think I'm near the halfway point although I haven't really counted them in a while. If anyone has traded some to me and you don't see your name or correct count number in the tally list, please let me know and I'll review my records; please note that I won't post your name or quantity until I have the cards in hand. And come on people, there are great prizes up for grabs!!!!! I'll trade for the bronze borders so you will not only have the chance to win, but you'll get value back as well! To the anonymous benefactor by the initials "JM" from Skokie, Illinois: thank you very much. An unexpected and welcomed package showed up in my mail box today and I couldn't have been happier to open it up to find 51 cards from my 1978 Topps need list. I know I had a person or two say they'd send me some cards in exchange for nothing, but I certainly wasn't expecting this many! Thanks for the great cards and they already look great in the binder! Only about 180 cards left to complete the entire set! Getting so very close! Thanks to "JM" for helping me well along the way! If there's every anything you need, please let me know! That's going in my Astros collection even though it lists him as a Phillie. A sweet printing plate, it'll look nice next to my 2010 A&G Lance Berkman black printing plate! Thanks Michael. This is the second trade we've pulled off, and we're working on a third as he persistently attempts to pull the Rickey Henderson card from my collection! Can't wait to post that trade as well! The third and final trade is with my good buddy David (aka Rhubarb Runner) who's blog title name is unpronounceable and thus I won't try to type it. I think it's Latin for "I SEND AWESOME TRADE PACKAGES" but I cannot confirm that as I only really know English... back to the cards... months ago David teased me by sending the redemption card he pulled for a 2010 Bowman Platinum Chris Johnson auto/relic. Well, after months of waiting, I got it!!!! Along with some other Gypsy Queen needs and some more UD 20th Anniversary Cards in exchange for some more Twins goodness sent his way! Thanks David! 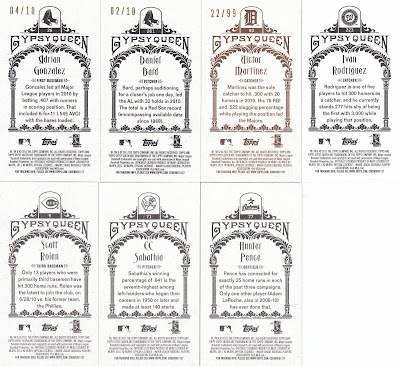 That brings my Gypsy Queen 1-300 base needs down to 2 cards! Woo-hoo!!! The local card shop had a big bin of game-used and autos marked 50% off so I delved in and spent my weekly $20 on these three plus a couple for my personal collection. The Dawson is pretty sweet if I say so myself! The Perry I got mainly because of those powder blue uniforms Texas used to have and I just KNOW someone is going to be all over that Fielder/Pujols combo! Have a great weekend everyone! Looks like lots of yard work for me, as we finally got some rain! I got one package in the mail today... from Ryan H. (yes, there are multiple Ryan's out there and it's confusing the hell out of me when they all try to trade with me at once... I'm a dimwit I tell ya, I can't handle such things!!!!). He runs the blog "O" No!!! Another Orioles Blog. He admittedly lured me into a trade by offering up a bronze bordered Evan Longoria, he also offered up a couple SP's and an insert or two.... finally, he sent along an additional 13 UD 20th Anniversary cards (good googaly moogaly it's going to take me forever to put this set together), I'm not even 1/4 of the way yet so keep 'em coming!!!!). Well, here are some highlights! Hey everyone, the wife and I just got home from our first Astros game of the season... an embarrassment at the hands of the Reds, apparently Homer Bailey is unstoppable. Needless to say we're old and didn't stay until the end. I got free tickets through an old high school buddy who is now the Astros "Director of Entertainment" which, from the product on the field tonight, I'm assuming he's not in charge of the actual team... GREAT seats though about 10 rows up behind Astros' on-deck circle. I was very happy to yell at Carlos Lee a few times. The Biggio is especially sweet as it is numbered 65/88, the Bagwell is 92/125, both solid hits and great additions to my collection. My Bagwell "hit" collection is pretty low in quantity, so I always appreciate anyone who runs one of these down to send my way. Thanks Ryan! Vlad and Matt Kemp, I know I've got another Kemp headed my way from the duplicates from the group break, so that'll be one I have available for trade!!!! Thanks Derek! Next up is Matt Hickes from Cardboard Anathema: he sent a long a nice stack of "Great Ones", "Home Run Heroes" and "Future Stars". Plus a bronze border and an SP, as seen below! 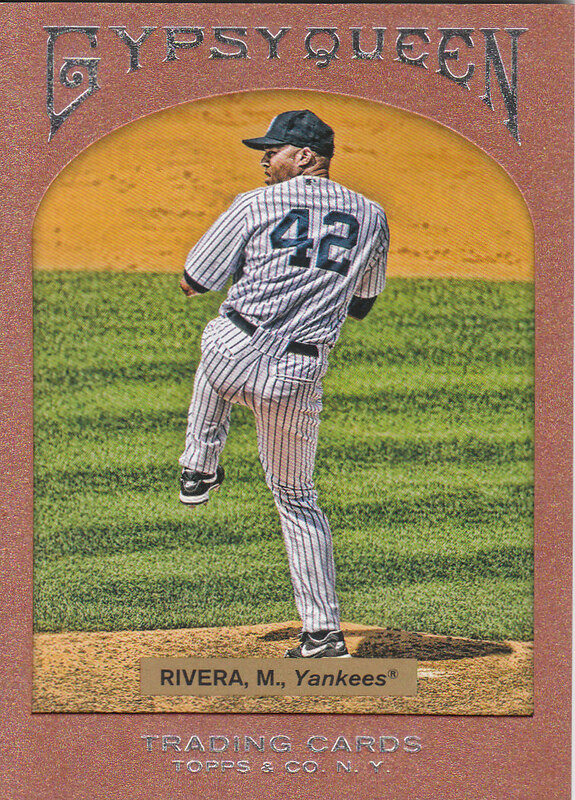 Stupid scanner cut them off... me and the scanner are going to have a serious discussion later tonight and if he doesn't get his act together, he's getting the "Office Space" treatment... Ok, sorry scanner I didn't meant it, just stop cutting off the bottoms of the cards! Great cards, thanks again Matt! BY GOLLY IT'S GRADY!!!! Sorry, I feel the need to speak country-fied whenever I see someone named Grady... alright, that's it... it's bed time... goodnight blog-o-sphere... oh yea, on a totally unrelated note, it looks like we're going to be moving... like to another state... like Alabama... this summer... Mobile here we come! That's that "big news" I mentioned a few weeks back, life is about to get crazy!!!! I set up a couple of trades during the week and got the cards in... in the scan below, the top three cards come from Napkin Doon. The Oswalt and Pettitte were featured on his trade bait post and I was able to get them both, along with some additional Astros like the SWEEEEET Biggio card shown, for the Josh Hamilton bat relic I pulled from Gypsy Queen. Very nice cards! Thanks Napkin! The bottom card is a Cracker Jack Berkman relic from Ben over at BaseballCardsRule that I got in exchange for the Oswalt jersey card I pulled from the group break Ovation box. I already had that relic card, so getting it in the break made it a duplicate and was able to trade it to a fellow Astros blogger. Thanks Ben! At this point I now have almost 2 full 8-pocket pages of Berkman relics and a full page of Oswalt relics. I think I may go ahead and shut down acquiring any more of these two players' relics; although I am still open to trading for either of these guys' autographs, of which I have ZERO. Also, I'm done with Carlos Lee. No offense to anyone except him, but I have no desire for any more of his cards, no matter how nice, shiny or full of relics and autos they are. He's an albatross of a contract and the bane of my collecting existence. I also picked up another 1/1 card recently... as you can see below... this is my second 1/1 Richard Nixon card from Masterpieces. Jeff from I Am Joe Collector pulled another 1/1 of Nixon in his latest case, and I would have LOVED to add it as well to my collection, but alas I don't think it's in my price range. If anyone wants to buy it, and let me trade for it from you I'd be more than willing!!!! He has the Red Border 1/1 currently, and now I own the Blue Border 1/1 and the Artist Proof 1/1. 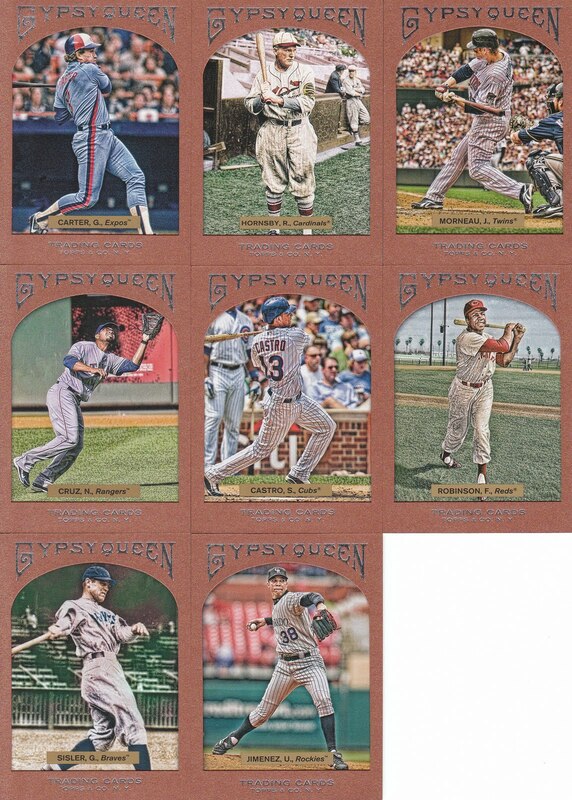 I also got in my cards from Nachos Grande's Gypsy Queen Group Break. He offered up his final four unclaimed teams: Astros, Royals, Blue Jays and Angels at a discount so I went for it. I got a few cards I needed for my overall set, including an SP. I also got a Hunter Pence bronze border! Astro and Bronze, gotta love it! Thanks for the great break Chris! I did a little bit of organizing as well today and yesterday, cleaning out 2007 Bowman Heritage from the "need list section" and from the corresponding binder. I just don't think I was going to get the rest of that set through trade and I'm not quite motivated to buy the remaining cards, so unless someone happens upon the want list by searching the blog, I'm not going to worry about completing it at this point. 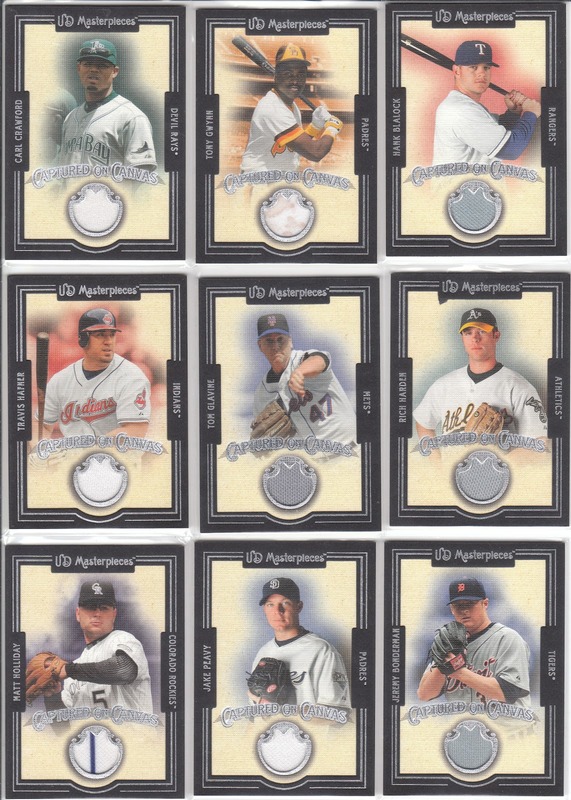 I also have decided to only collect the Kimball Mini's inserts from 2011 Topps and have reduced my want list to only those cards. That will also free up a lot of inserts FOR TRADE, so keep an eye out for my 2011 Topps available spreadsheet to come soon. Finally, I have added a separate area in the side bar that links to my AVAILABLE FOR TRADE cards. I started using Google Docs spreadsheets and I LOVE them. Easy to use, update on the fly and share live. 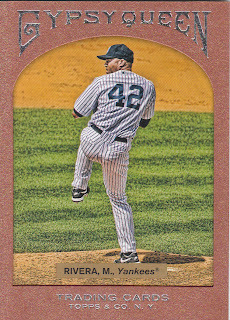 Currently I only need to add my 2011 Topps cards which are available. I should be able to get those up today or tomorrow. I will be getting more and more of these spreadsheets up as time goes along and I get organized a bit. Also, a quick reminder about my current contest running on the blog! You know this will be pimped on pretty much every post from now until the contest concludes, so the faster you all help me, the less you'll have to read about it! Hahaha! Have a great weekend and Mother's Day! 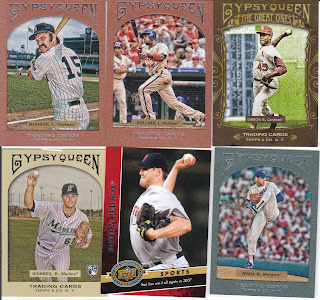 2011 Gypsy Queen FOR TRADE List and CONTEST ANNOUNCEMENT! Wow, alright everyone... 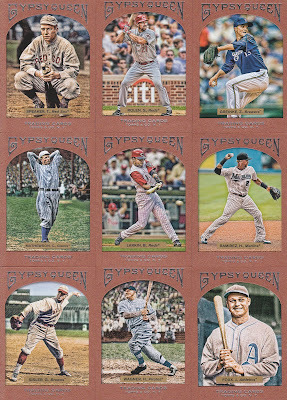 I spend a large part of my morning putting a Google spreadsheet together with my 2011 "FOR TRADE" Gypsy Queen checklist. 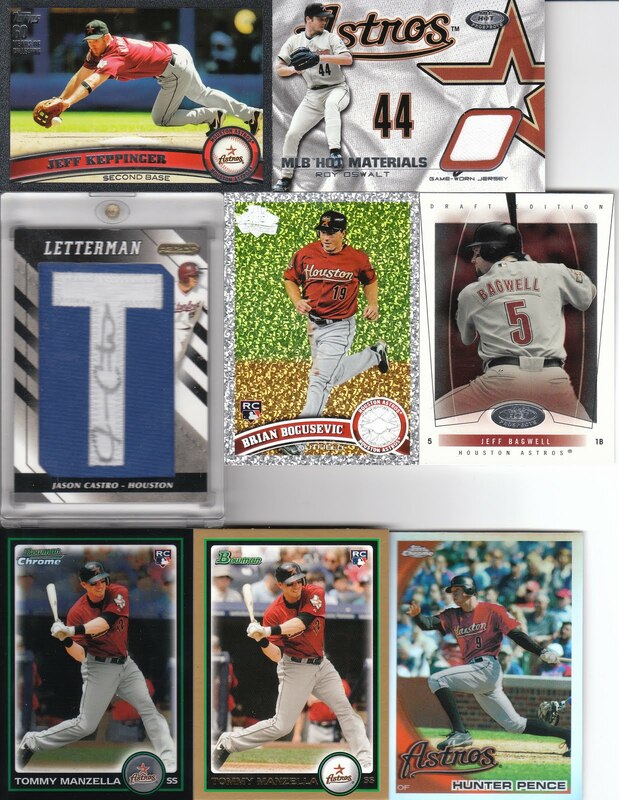 I updated my "want list" on the side bar with the cards that I got from the card shop yesterday as well as from trades that I'm expecting in the mail within a day or two. Amazingly I'm down to just 5 base cards needed!!! One of which is Nolan Ryan's Rangers base card, which Brian over at Play At The Plate is sending back to me from the group break (because he got duplicates and he's awesome like that), so once I get that I really only have 4 base cards left! Woo hoo!!!! Additionally, in looking through my cards I realized I wasn't too far from completing all three of the insert sets (Home Run Heroes, Future Stars and Great Ones) so I went ahead and added those to the want list as well. Just like his contest, each card you trade or send my way will get you an entry into the contest. Once my 100 card set is complete, I will be giving away 3 prizes. Third Prize will be a jersey/auto card from your favorite team that I have in my collection. If I don't have a card from your team, I'll go out and get one for you. Well, hopefully that is enough to entice some trade offers on the bronze border cards! I will trade for each and every one of these you have, but of course if you just feel like sending me some of these merely for the contest entry, I'm totally OK with that. Please let me know what you're sending ahead of time so I can update my want list accordingly! With the one Brian is sending me from his group break duplicates, that's 1 entry! Derek over at Tomahawk Chopping has two in the mail headed my way in a trade, so he unknowingly gets 2 entries! I'll get a sidebar tally going after I post this. Let me know if you have any questions! Yep, that's a "leather" Mickey Mantle #'ed 10/10. I've put it up on eBay but if there are any bloggers out there who want to make an offer for it, I can take it down as long as it hasn't sold. This card is another one in my long history of pulling not only just Dodger cards, but also Matt Kemp cards. Of course, this one is for trade. Have a great day! Needless to say, much better than the group break. As for the relics, 3 HOF'ers and an MVP are nice, then the redemption auto for Frank Robinson to top it off. Cashner seemed to have signed about 10,000 of these cards because I've seen them pop up everywhere, including the group break. 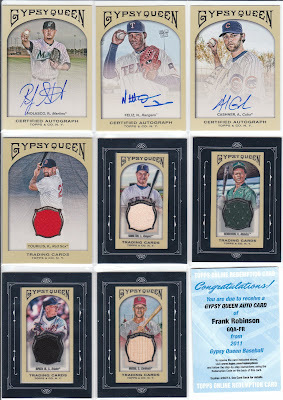 Neftali and Nolasco are solid auto's. Of course with only 9 hits in three boxes, I was short 3 hits, so I have mailed those UPC's off as well for redemption from Topps. We'll see how this goes. All hits and mini's are up for trade. 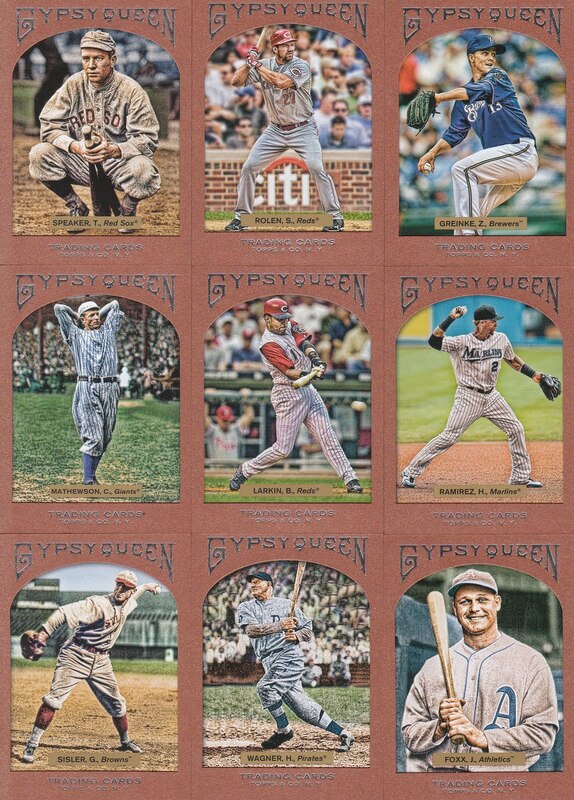 I have a bunch of red-back mini's, and of course 9 mini's of the "insert" sets available as well. 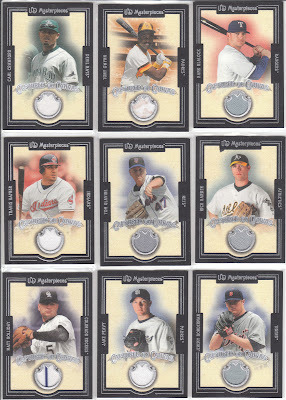 Not to mention that I have a BUNCH of duplicates at this point for trade of the base and (3) SP's for trade as well. I'm a total of 36 SP's and 22 base cards from set completion, so if there is anyone out there looking to make a swap to clear out each other's needs, let me know. And yes, I pre-posted this on Sunday and accidentally posted it live... then took it down... and then re-scheduled it for Tuesday... so, for most of you this will be "new" and for the rest you may have seen it briefly on Sunday... oops... they don't call me the dimwit for nothing! That's a black border from this year of Keppinger numbered to 60, then an Oswalt jersey card and then the grand centerpiece of the trade, the Jason Castro signature from Razor, very nice! I threw in a few other cards from the trade. Hopefully Mike will enjoy the cards I'm sending his way as much as I'm enjoying mine! Thanks again Mike, another great trade! Next up, a smattering of cards from his group break... one of the most awesome group breaks I've been a part of. Every time I refreshed my Google Reader, it seemed there was another video from Mike opening packs (of course except for that period of time his computer crashed, but not his fault... haha!) Thanks for the group break Mike, it was great! I am fairly certain that I can say that I didn't have any of the above cards before this break! Great job Mike and can't wait for your next break! I will trade for ANY Astros base parallel. Product Review Time! Thanks to EasyCanvasPrints.com! As some of you may have noticed recently, I gained an additional blog sponsor with EasyCanvasPrints.com!!!!! My wife and I had been talking for a while about getting a canvas print from our wedding to adorn and empty wall in the home. Well, this opportunity was just too great to pass up! After a couple of e-mails we agreed to pay for some of the shipping in order to get the print size that we wanted. Also, I had to track down our wedding photographer to get better resolution prints to use, as the originals we had were too low res. Well, needless to say it turned out great. First of all, I'll go over the website interface. It honestly couldn't have been easier to put together the print that we wanted. First we chose the 30"x40" size photo print because we wanted a larger than usual photo. Then, we chose the 1.5" thick border and the picture wrapped border. Again, every step was easily laid out and couldn't have been easier to select the options that we wanted. We went through our catalog of photos, several hundred and finally picked the one wanted and uploaded it. The final step was to crop and move it onto the template so it would be laid out exactly how we wanted it. Overall, the design process was an A+. Shipping was next. It was ordered on Tuesday the 26th, and promised by May 7th. However, they did an amazing job and our print shipped on Friday with expected FedEx delivery by the 2nd. FedEx outdid themselves and actually delivered it yesterday! We were out of town (in Austin at The Decemberists concert, it was awesome) but my in-laws stopped by our house and picked it up off our porch. The only think I wish I had done is set it up for "signature required delivery" but that's because I live in the ghetto and have had stuff stolen off our porch before! My mistake, not theirs. It all worked out though and when we got back in town this afternoon we had to stop by the in-laws' house to pick up our dog and package! Upon opening up the box, we were pleasantly surprised to see exactly how much padding and shipping prep was done to insure there was no damage to the canvas print. First there was bundled butcher paper protecting all four corners, then there was bubble wrap encompassing the entire print, and finally there was saran-style plastic wrap enveloping the entire print. It was all done in such a way as to protect the product from pretty much any shipping obstacle. Overall, shipping was another A+. And to give a bit of perspective, here's a picture of it with me standing next to it! It came out great! It was solid and sturdy. The canvas stapled to the frame all around the inner frame and the resolution was amazing. Truly a great job by EasyCanvasPrints.com. If you ever have a need for a canvas print, I wouldn't hesitate for a second to head to their website and start my order. This is one site that definitely lives up to it's name! For the actual product, my wife and I give it an A+. We are completely satisfied and grateful for the chance to work with this company and provide you readers the chance to see their work. Thanks again to the team at EasyCanvasPrints.com!! !